What’s the only thing better than a free Wi-Fi hotspot? Free coffee to go with it, of course. Alas, free, all-you-can-drink java is pretty rare, but free public Wi-Fi networks are easy to come by. You’ll find them in coffee shops, airports, food courts, and libraries, among other places. But are they safe? As a matter of fact, no. An open network is, by definition, open, meaning hackers can more easily weasel into your system and steal your data — perhaps even your identity. Does that mean you should steer clear of your local Starbucks and other Wi-Fi-enhanced hangouts? Heck, no. It simply means you should take a few precautions. With the right tools and by following five simple ground rules, you can keep your laptop secure on any network — and in any location. Suppose you’ve plunked down at a coffee shop to get some work done. Your laptop detects two available Wi-Fi networks: “Joe’s Coffee” and “Free Public Wi-Fi.” The latter sounds harmless enough, but it could be a fake network set up by mischievous hackers. And by connecting to it, you run the risk of exposing every piece of data you send and receive. To avoid these kinds of interceptions, bypass networks with plain-vanilla names. Instead, look for one that seems appropriate to the business or venue that’s hosting it. Better yet, look for the password-protected network that appears to be owned by the establishment you’re visiting. When in doubt, ask someone who works there what their network is called. If you’re a customer, they should be happy to tell you the network name and password so you can start surfing. Want an easy way to foil hotspot hackers? Here’s a tip brought to you by the letter ‘S’: When you type a Web address into your browser, preface it with “https” instead of the usual “http.” The former activates something called Secure Socket Layer (SSL), which is a fancy term for encrypted browser traffic. See, without SSL, hackers can sniff out the text you’re transmitting with your browser. That’s no big deal for, say, Google searches, but what if you’re typing in your Yahoo email password? Now we’re in big-deal territory. Some sites default to https, but keep an eye on your address bar to make sure it’s there — and add the ‘S’ if it’s not. Fast, simple, effective. A thief might be able to break into your house, but that safe you keep in the closet? No way he’s getting in there. You can apply the same principal to your laptop with a security suite that features an encrypted-storage solution, which is like a vault for your data. Once enabled, this password-protected vault provides a hacker-proof haven for sensitive documents, photos, and the like. Thus, even if a hacker manages to break into your PC (or make off with it), your data will remain safe. Done checking email and hitting up your favorite websites? Then why not turn off Wi-Fi? That’s the best protection you can buy, and you’ll get the added bonus of longer battery life. Of course, you’ll still be able to use your word processor, watch movies, and so on — activities that don’t require Internet access. Many laptops have a physical switch or keyboard function key that can toggle Wi-Fi on and off. Alternately, you can simply venture into the control panel or settings and deactivate Wi-Fi from there. Data security is one thing, but don’t forget about securing your actual laptop. In the minute or two it takes you to go refill your coffee cup or answer the call of nature, a thief can easily walk off with your pricey property. Kensington's Laptop Lock deters laptop theives. Enlist some hardware help in the form of a lock, like the $25 Kensington Portable Combination Laptop Lock. 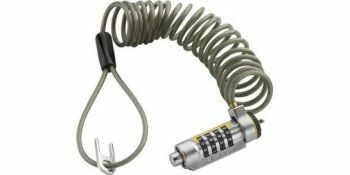 It combines a compact, coiling cable with a four-digit combination-based T-bar lock, and it works with any laptop that has a security slot (most recent models do). Just wrap the cable around a bolted-down table leg or some other fixed point, and chances are good a thief won’t even bother trying to nab your notebook. Finally, if you’re thinking about upgrading, make your next laptop an Ultrabook. Starting in June 2012, all Ultrabooks will pair hardware-based security features with smartphone-like anti-theft software, thus affording remote lock, remote data wipe, and location tracking. Maybe they should start calling them Smartbooks. This story, "Five Rules for Using Your Laptop On Public Wi-Fi Hotspots" was originally published by BrandPost.